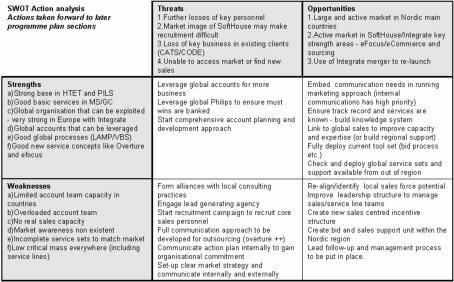 SWOT (Strengths Weaknesses Opportunities and Threats) Analysis is a simple but surprisingly effective technique to assess an organisations positioning and begin the process of turning general ideas for market growth into actionable activities. This brief guide shows how to extend the simple SWOT concept into a tool for defining the actions needed to deal with external threats and internal weaknesses in the organisations capabilities. The process is best done within a workshop concept. So organise a team meeting of around 7 to 10 interested parties who are experts or knowledgeable in the domain to be considered. Step 1 – First agree the area to be considered and the core assumptions. For example ‘we will consider the Softhouse organisation and the opportunities to grow the market in the States. Step 2 – Use a brainstorming technique such as nominal group and ask the team first to think about the area we have chosen and what the issues in delivering this approach are. They write down (on their own) what could be the barriers or carriers to entering the new market in the States onto post-it notes or just make a list on paper before them. Step 3 – They place their post it notes (or the facilitator) in turn onto the grid as shown in the diagram below – barriers to threats and carriers to opportunities. Step 4 – Brainstorm as in step 2 and consider the organisation (Softhouse) and what are its unique strengths or capabilities and its weaknesses. The team on their own write down onto post-it notes their ideas as before. Step 5 – They place their post-it notes (or the facilitator) in turn onto the grid as shown in the diagram – strengths to strengths and weaknesses to weaknesses. 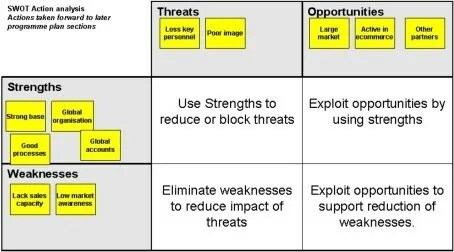 Step 6 – The team then consider the crossing points of the SWOT for example between Threats and Strengths below (top left box) and as shown in the diagram think of specific actions to use strengths to counter any threats. These are written onto post it notes as before and placed in turn into the grid. Step 7 – The facilitator tidies up the board removing duplicates or clarifying actions that have been written down. The board actions are then agreed prioritized then transferred to a standard action plan template. Here is an example taken from an early draft of a business plan to illustrate the completed board. From here the actions can be taken across to a standard action plan template and owners and timescales applied. Thus from an initial consideration of the external and internal environment we can quite quickly move to a position where we can see possible practical actions we can take to move the agenda forward.